IL TROVATORE:Verdi Original Air Date: 02/04/1961 Cleva; Corelli, Price, Dalis, Sereni, Wilderman MOD Audio SID.19170210 This is now on Sony Historic CD as well as MOoD. Only a few weeks after Corelli and Price’s joint … Continue reading "IL TROVATORE"
IL TROVATORE:Verdi Original Air Date: 02/04/1961 Cleva; Corelli, Price, Dalis, Sereni, Wilderman MOD Audio SID.19170426 This is now on Sony Historic CD as well as MOoD. 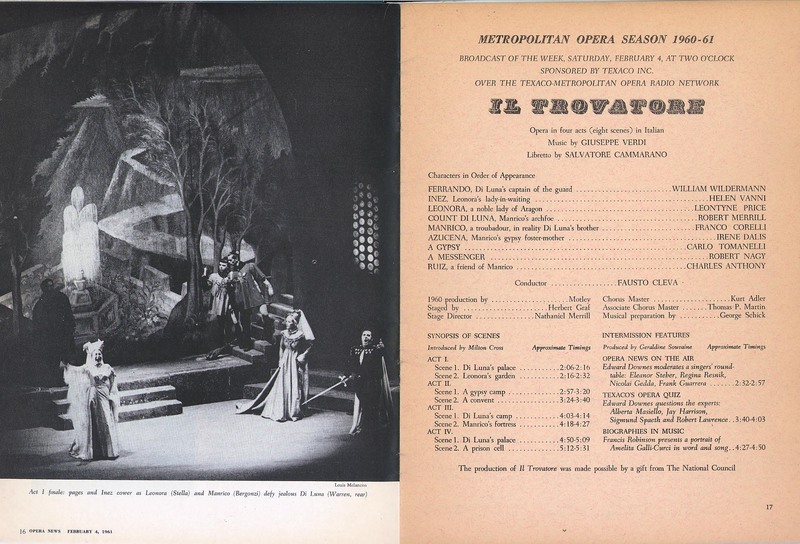 Only a few weeks after Corelli and Price’s joint … Continue reading "IL TROVATORE"
IL TROVATORE:Verdi Original Air Date: 02/04/1961 Cleva; Corelli, Price, Dalis, Sereni, Wilderman MOD Audio SID.19170741 This is now on Sony Historic CD as well as MOoD. Only a few weeks after Corelli and Price’s joint … Continue reading "IL TROVATORE"